A few weeks ago, seven intrepid women came together to backpack through an area we lovingly call The Buttes. We celebrated ourselves under the light of the full moon, washed away our worries in mountain lakes, reignited our strength on challenging trails, and remembered how to lean into the support of Mother Nature and other women again. Here’s a mini-recap of our 3-day Quiet Adventure in The Buttes. I hope you enjoy it! And for the women who I had the honor of sharing this magical weekend with—may this post serve as an anchor to help you stay connected to the strength, courage, and authenticity you found on this retreat. May you always remember the amazing memories we co-created together! We all arrived at our meeting spot, bright and early, with curious minds and open hearts. From the moment we met, the energy of the group was overflowing with compassion, realness, and love. Everyone was eager to get to know each other and to dive into the experience. The women commented on how fresh the air smelled, how little noise there was, and how stunning the surroundings were. The sun was shining brightly so we looked for a shady spot for our opening women’s circle. It felt good to sit on the earth with this new group of women. Welcoming each women and looking one another in the eyes—we had all finally arrived! I guided the group through a journaling prompt that helped us to begin to get clear on what’s not working in our lives and discern what’s ready to change. Then, each woman drew a Mother Nature Wisdom Card and started to share beyond the basics, getting to the real stuff: the stress of juggling a career and family, loss and grief, the dream of finally starting to take care of themselves, even when they’re taking care of everyone else. One by one, each woman shared her hopes, dreams, and fears. At the end, we all took a deep exhale together and sat with the comfort of being able to connect with other women in real and meaningful ways. This is truly one of my favorite parts of every Quiet Adventure. Next, we prepared to hit the trail. The women divided up their group gear, decided what was essential for this trip, packed (sometimes several times) their backpacks, and asked questions to deepen their knowledge along the way. Together, we took the time to leave behind the things that were weighing us down (figuratively and literally). It's never easy, but these women took the leap and carved out a weekend just for themselves. From making childcare arrangements to getting on planes to changing client appointments to closing their businesses for a couple of days. Each woman embarked on an incredible journey to make this retreat a reality. As women, it seems like our calendars and lives are always so full. We rarely have the time to take an hour in the day, let alone an entire weekend for ourselves. But when you intentionally take time to get quiet, connect with yourself, and nourish your mind, body, heart, and spirit, you're able to show up for your life as the grounded, strong, and empowered woman that you are. And that’s exactly what a Quiet Adventure helps you do. As we set foot on the trail, it became clear that all of the arrangements and challenges were worth it! Being with supportive group of women, feeling the freedom of being in the wild, and carrying everything we need to survive on our backs, instantly had us all feeling like we could do anything. It’s a deeply powerful experience, and one that I felt honored to lead these women through. It was really hard to step away from work and be unavailable to customers for three days, but I’m so glad I did! As I arrived, I realized how much I needed to reconnect with myself, return to nature practices, get away from the craziness of summer and work, and just be. 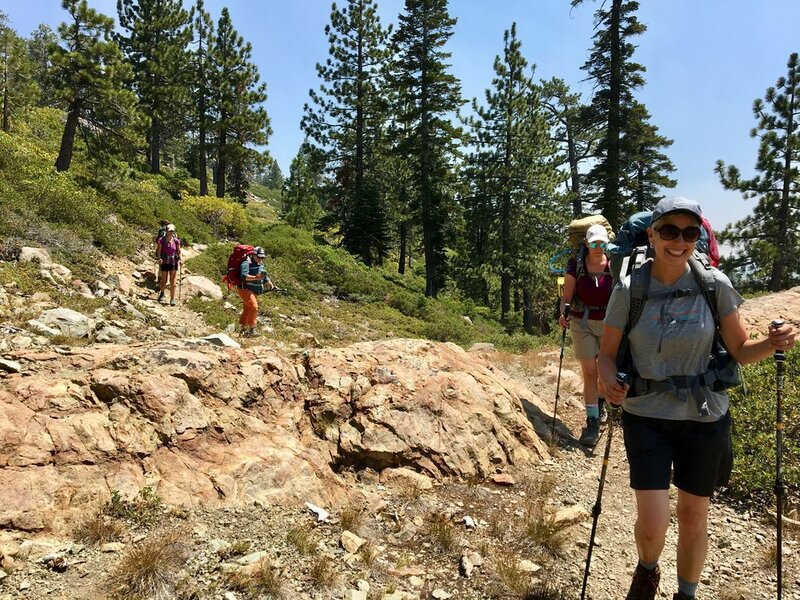 Coming from all walks of life and experiences, some women were first-time backpackers and others were seasoned outdoors women, but every woman had something truly unique to offer the group. From telling amazing stories to making us laugh until our bellies hurt to listening in a way that made us feel seen to pitching a tent like a pro, everyone's individual gifts became clear as we arrived and set-up camp. And that is the essence of Quiet Adventures: an incredible caliber of women, respect for everyone’s individual contribution, and shared wisdom. 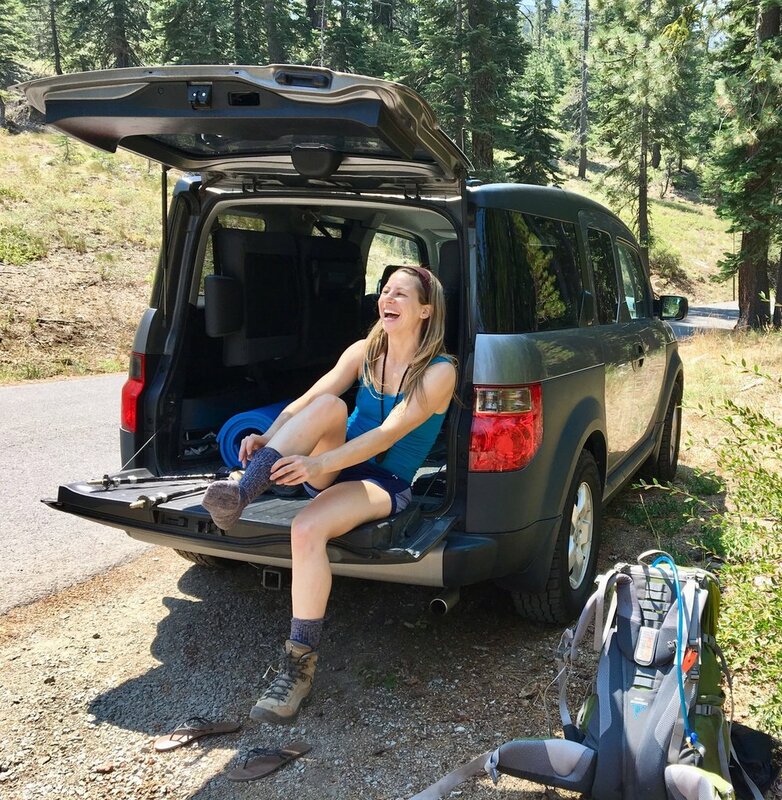 One of the main reasons women choose to join a Quiet Adventure is to step away and quiet the noise. So we made ample time to practice simple, yet powerful practices to help us get grounded, calm our nervous systems, and hear our inner voices again. From journaling to meditation to quiet hours, each practice is intentionally designed to support women in learning how to connect on a daily basis, especially when things get hard or spiral. We nourished our bodies with yummy food, hiking, lake swims, playing in the dirt, and yoga—leaving us full in the best of ways! We gave ourselves permission to rest and do nothing. We nurtured our hearts with deep listening, connection, and laughter. Through the challenges and adventure of being in the outdoors, we learned how to be comfortable with being uncomfortable. It was hot, the air was smokey from the wildfires, and the trail no longer matched the map due to a PCT reroute. So, on the last night, we had to scout extensively for a place to camp. Yes, it was unplanned but we embraced the challenges, tapped into newfound strength, and supported one another through it all. 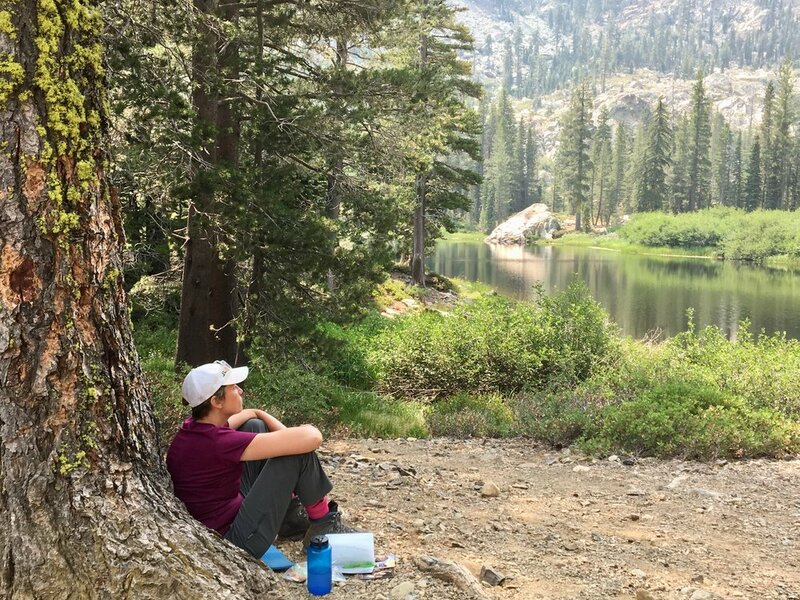 By learning how to take care of ourselves in the outdoors, we developed a greater sense of who we are, what we can do, where we are going, and what we need to do to get there (both on and off the trail). What I love about Quiet Adventures is that each retreat gives us time to remember who we truly are and who we most want to be. In their daily lives, these women carry the roles and responsibilities of wife, mother, partner, friend, therapist, educator, writer, jewelry artist, and entrepreneur. On the trail, they remember that while they are all those things—they are also so much more. They are storytellers, lake swimmers, backpackers, nature-lovers, and map readers. They are strong and soft, open and accepted, wild and free. Pictures in this post by: Tiffany Anne Whipps, Linda Sperl, Kelly Edmundson, Amanda Ryan Fear, Rewa Bush, and Megan Roop. Newer PostREI Adventures vs. Quiet Adventures: Which Is Right for You? See what it's like to join us on a Quiet Adventure!